Improper use of antimicrobials results in poor treatment and severe bacterial resistance. Breakpoints are routinely used in the clinical laboratory setting to guide clinical decision making. Therefore, the objective of this study was to establish antimicrobial susceptibility breakpoints for danofloxacin against Escherichia coli (E.coli), which is an important pathogen of digestive tract infections. The minimum inhibitory concentrations (MICs) of 1233 E. coli isolates were determined by the microdilution broth method in accordance with the guidelines in Clinical and Laboratory Standards Institute (CLSI) document M07-A9. The wild type (WT) distribution or epidemiologic cutoff value (ECV) was set at 8 μg/mL with statistical analysis. Plasma drug concentration data were used to establish pharmacokinetic (PK) model in swine. The in vitro time kill test in our study demonstrated that danofloxacin have concentration dependent activity against E.coli. The PK data indicated that danofloxacin concentration in plasma was rapidly increased to peak levels at 0.97 h and remained detectable until 48 h after drug administration. The pharmacodynamic cutoff (COPD) was determined as 0.03 μg/mL using Monte Carlo simulation. To the best of our knowledge, this is the first study to establish the ECV and COPD of danofloxacin against E.coli with statistical method. Compared to the COPD of danofloxacin against E.coli (0.03 μg/mL), the ECV for E.coli seemed reasonable to be used as the final breakpoint of danofloxacin against E.coli in pigs. Therefore, the ECV (MIC ≤8 μg/mL) was finally selected as the optimum danofloxacin susceptibility breakpoint for swine E.coli. In summary, this study provides a criterion for susceptibility testing and improves prudent use of danofloxacin for protecting public health. Escherichia coli (E.coli) are a common member of microflora of the gastrointestinal tract of animals and humans. Pathogenic E. coli associated with gastrointestinal disorders have been divided into eight pathotypes based on their virulence profiles: enteropathogenic E. coli (EPEC); enterohaemorrhagic E. coli (EHEC); enterotoxigenic E. coli (ETEC); enteroinvasive E. coli (EIEC); enteroaggregative E. coli (EAEC); diffusely adherent E. coli (DAEC); adherent invasive E. coli (AIEC); and shiga toxin-producing enteroaggregative E. coli (STEC) . Among them, ETEC infects both humans and several species of farm animals such as pigs. In humans, ETEC is the main cause of bacterial diarrhea in adults and children in developing countries and also a leading cause of traveler’s diarrhea [2, 3]. In pigs, enteric diseases due to strains of ETEC are the most commonly occurring form of colibacillosis including neonatal diarrhoea and postweaning diarrhoea (PWD), which result in significant economic losses due to mortality, morbidity, reduced growth rate and cost of medication . Quinolones, which trap DNA gyrase or topoisomerase IV to form reversible drug enzyme DNA cleavage complexes, to cause bacteriostasis, have a high bioavailability, good tissue penetration, long half-lives, high efficacy, and low incidence of adverse effects. Because of these characteristics, they are widely used against several respiratory and gastrointestinal infections in both humans and animals [5, 6]. The antimicrobial treatment of traveler’s diarrhea has changed over the years because of the increasing resistance of ETEC to common antibiotics. So far, fluoroquinolones have been shown to be an effective therapy for ETEC traveler’s diarrhea [7, 8]. 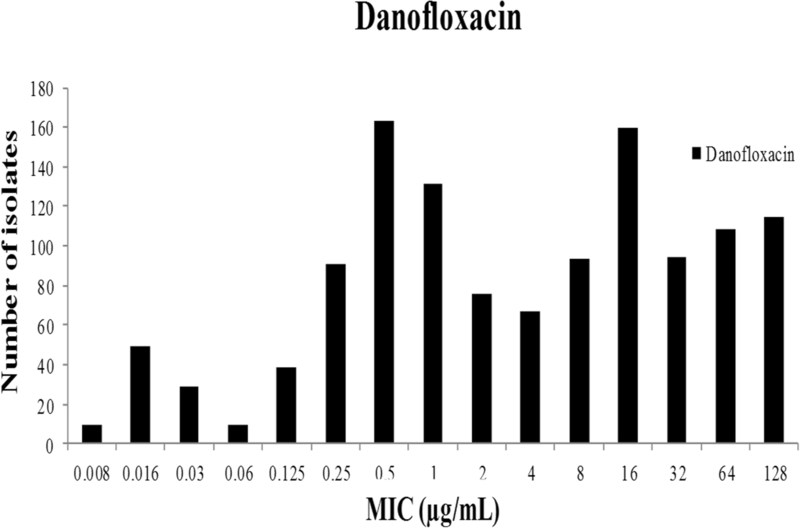 Danofloxacin (DANO), a third generation fluoroquinolone antimicrobial drug with rapid bactericidal activity, is often employed to treat colibacillosis in swine via oral or intramuscular administration [9, 10]. However, their extensive use has also serious non-desirable impacts and represents a public health danger. For example, it may stimulate the emergence of zoonotic quinolone-resistant E.coli in the food-producing animals, which can ultimately be transmitted to the human by direct contact or through the food chain [11, 12]. Plasmid-mediated fluoroquinolone resistance genes (qnrS and aac (6′)-Ib-cr) are detected in both patients and pigs in Shandong, China, and these resistance genes can be transmitted horizontally . Improper use of antibiotics results in severe bacterial resistance. Breakpoints are routinely used in the clinical laboratory setting to guide clinical decision making. A combination of MIC values, pharmacokinetic/pharmacodynamic relationship and clinical outcome data are needed to set breakpoints . However, this kind of data needed for breakpoint determination is so difficult and expensive to generate. Epidemiological cutoff values (ECVs) are the useful tools for laboratories conducting susceptibility testing and for clinicians treating infections. Those tools also offer alternative ways for monitoring the emergence of drug resistance in any given bacterial species . ECVs establishment using the CLSI method must include MIC distributions (≥ 100 MIC results per species and Antibacterial agent) from multiple (≥ 3) independent laboratories [15, 16]. Previous studies demonstrated that a statistical method was a professional and scientific method which has been adopted by the CLSI as a standard method for ECV determination [17, 18]. Pharmacodynamic cutoff (COPD) is associated with clinical efficacy, as both WT values and PK/PD data are used to setting COPD without clinical cutoff values . The COPD was defined as the MIC at which the probability of target attainment (PTA) was ≥90% . Monte Carlo simulation has been employed to assess the probability of attaining the desired AUC:MIC ratio, and it provides a means by which probability outcomes, such as achieving the PK/PD target, can be attained without the rigor, time, and expense of clinical trials [21, 22]. The purposes of the present study were (i) to develop ECV of DANO against E.coli using a statistical method and (ii) to establish DANO COPD for E.coli based on Monte Carlo simulation. From July 2014 to March 2017, a total of 861 E.coli isolates were identified from 864 rectal/cloacal swabs of pigs. Isolates were collected from Heilongjiang (n = 296), Jilin (n = 151), Liaoning (n = 238), Henan (n = 97), Shandong (n = 30), Hubei (n = 20), and Yunnan (n = 29) provinces of China. As shown in the primitive DANO MIC distribution in Fig. 1, MICs for DANO against 1233 E.coli isolates (861 isolated, 372 donated) were in the range of 0.008 to 128 μg/mL. The percentages at each MIC (0.008, 0.016, 0.03, 0.06, 0.03, 0.25, 0.5, 1, 2, 4, 8, 16, 32, 64 and 128 μg/mL) were 0.73, 3.97, 2.35, 0.73, 3.16, 7.38, 13.22, 10.62, 6.16, 5.43, 7.54, 12.98, 7.62, 8.76 and 9.33%. The MIC50 and MIC90 were 4 and 128 μg/mL, respectively. The MIC distribution (0.008-128 μg/mL) for DANO was statistically consistent with a normal distribution because the skewness (− 0.321) and kurtosis (− 0.731) were negative. As the normal (Gaussian) distribution is widely accepted, non-linear regression curve fitting of cumulative log2 MIC data was selected as the preferred method for determining the means and standard deviations of MIC distributions. The procedure involved fitting the initial subset and generating estimates for the number of strains in the subset, the mean and the standard deviation (in log). This procedure was repeated by adding to the previous subset each successive column to create the next subset, and repeating the curve-fitting until it was clear that there was a subset where the absolute difference between the true and estimated number of isolates was a minimum. As shown in Table 1 and Fig. 2, the seven subsets examined showed that the subset ‘MIC = 8 μg/ mL’ gave the minimum difference. As a result, the ECV was defined as 8 μg/mL. As presented in Fig. 3, the concentrations (1/4 MIC and 1/2 MIC) below the MIC of DANO can hardly inhibited the growth of E. coli JLP95. Similarly, the bacteriostatic effects of 1MIC and 2MIC of DANO are not obvious. However, the antibacterial or bactericidal effects are gradually enhanced when DANO concentrations were at least 4 times higher than MIC. Therefore, the in vitro time-kill test shows that efficacy of DANO against E.coli is concentration dependent. There are no adverse reactions after intramuscular injection of DANO. 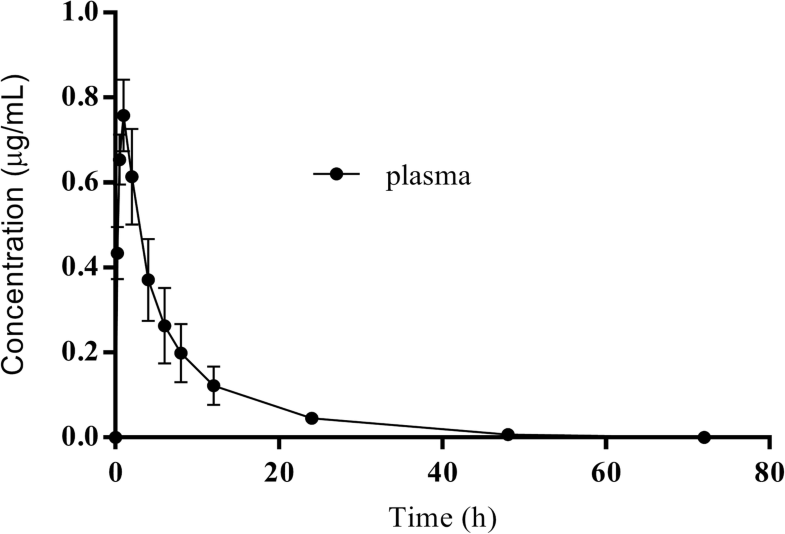 The concentration of plasma DANO was decreased below LOQ after 72 h. The concentration-time curves are presented in Fig. 4. According to MAICE, the plasma data were best fitted to a two-compartmental PK model for all six pigs. Pharmacokinetic parameters are shown in Table 2, the time to reach to maximum drug concentration (Tmax), the peak drug concentration (Cmax), and the area under the curve by 24 h (AUC0–24) were 0.97 ± 0.08 h, 0.76 ± 0.08 μg/mL, and 5.25 ± 1.35 h·μg/ml, respectively. Results of a 10,000- Monte Carlo simulation for DANO based on MIC and AUC0–24, the probability of achieving various AUC: MIC ratios at breakpoints of 0.03 μg/mL are presented in Fig. 5. The red bars represent the number of simulated with AUC: MIC ratios < 125, whereas the gray bars represent with AUC: MIC ratios of ≥125. The probability of DANO attaining an AUC: MIC ratio of at least 125 is 92.25%. Therefore, the COPD was defined at 0.03 μg/mL. The following statistical parameters describe the DANO AUC: MIC probability distribution: mean 188.84, median 188.86, SD 44.91, variance 2017.05, skewness - 0.024, kurtosis 3.03, coeff. of variability 0.24, minimum range 10.42, maximum range 345.06, and mean std. error 0.45. DANO is a fluoroquinolone antibacterial drug that was developed specifically for veterinary use . However, the resistant E.coli isolates are emerging quickly with the use of these drugs . A total of 1737 E. coli isolates collected from the United States, Canada, Belgium, France, Germany, Italy, the Netherlands, Spain, the United Kingdom, Japan, and South Africa showed a high degree of susceptibility to DANO, more than 99.3% of the E. coli isolates with an MIC of ≤1.0 μg/ml . While, in our study, 50.82% of the E. coli isolates (n = 1233) with MIC >1.0 μg/ml for DANO, which indicated that temporal and geographic differences could be frequently found on the prevalence of resistance. Susceptibility breakpoints of quinolones and fluoroquinolones (ciprofloxacin, levofloxacin, cinoxacin, enoxacin, gatifloxacin, gemifloxacin, grepafloxacin, lomefloxacin, nalidixic acid, norfloxacin, ofloxacin, and fleroxacin) for Enterobacteriaceae have been established. CLSI  recommendations for testing human pathogens against fluoroquinolone, but few guidelines are available for the interpretation of veterinary MIC data. ECV can be used as the most sensitive measurement of the emergence of strains with decreased susceptibility to a given compound when compared with the WT population. These non-WT strains may exhibit one or more acquired resistance mechanisms . Several methods have been reported for determination of ECVs. For instance, Arendrup et al. estimated ECVs as 2-fold dilution steps higher than the MIC50 , Rodriguez-Tudela et al. estimated them as 2-fold dilutions above the modal MIC , and Kronvall and Turnidge et al. calculated ECVs by statistical methods [17, 18]. We used nonlinear least squares regression analysis reported in the CLSI methodology to determine ECVs. Finally, the ECV of E.coli for DANO was defined as 8 μg/mL according to the preliminary MIC distribution in our study. Several studies have established pharmacokinetic data for DANO in a number of farm animal species, including cattle, sheep, goat, chicken and pig [23, 29–32]. The difference in pharmacokinetic parameters between different studies may be due to different breeds or individual differences in pigs. In this study, after i.m. administration of DANO at a dose of 2.5 mg/kg body weight in pigs, the time to reach to maximum concentration (Tmax) was 0.97 ± 0.08 h, similar to 1 h as reported by Mann and Frame, but different from 0.64 h as described by Wang et al. ; the peak drug concentration (Cmax) was 0.76 ± 0.08 μg/mL, higher than 0.45 ± 0.09 μg/mL, and was half of 1.5 μg/mL reported by Rottboll and Friis which dosing 5.0 mg/kg; the area under the curve by 24 h (AUC24) was 5.25 ± 1.35 h•μg/ml, higher than 3.34 ± 0.43 h•μg/ml as reported by Wang et al. [10, 31, 33]. From a pharmacodynamic point of view, fluoroquinolones are considered concentration-dependent rather than time-dependent . The in vitro time kill test in our study demonstrated that DANO is also concentration dependent. Thus, the ratios of peak concentration or AUC with the MIC were reported as important determinants of the antibacterial effect of fluoroquinolones in vitro and the ratio of AUC24/MIC or Cmax/MIC were generally used for PK/PD modeling [21, 35]. The parameters Cmax/MIC and AUC24/MIC correlate well with therapeutic outcome. A correlation of these composite parameters to the efficacy of an antibacterial revealed that for fluoroquinolones an AUC0–24/MIC of ≥125 is predictive of favorable clinical outcome for Gram negative bacteria . The probability of DANO attaining an AUC: MIC ratio of at least 125 is 92.25%. Therefore, the COPD was defined at 0.03 μg/mL. To the best of our knowledge, this is the first study to establish the ECV and COPD of DANO against E.coli by statistical method. The COPD (0.03 μg/mL) was much lower than the ECV (8 μg/mL) established in our study, implying that the lower COPD in our study may be due to the lower dose of drug administration to pigs, because previous studies concluded that the dose of drug administration may affect the PK-PD breakpoint [36–38]. This suggests that (i) more dosing regimens need to be designed in future investigation; (ii) Further studies are needed to illustrate the relationship between DANO non-WT values proposed in this study and its resistant molecular mechanisms. Compared to the COPD of DANO against E.coli (0.03 μg/mL), the ECV for E.coli seemed reasonable to be used as the final breakpoint of DANO against E.coli in pigs. Therefore, the ECV (MIC≤8 μg/mL) was finally selected as the optimum DANO susceptibility breakpoint for swine E.coli, which could provide a criterion for DANO susceptibility testing and improve prudent use of DANO for protecting public health. The rectal/cloacal swabs collected on each farm from the pigs were pooled and tested as one analytical sample. Between July 2014 and March 2017, a total of 864 rectal/cloacal swabs of pig were collected in Heilongjiang (n = 297), Jilin (n = 151), Liaoning (n = 240), Henan (n = 97), Shandong (n = 30), Hubei (n = 20), and Yunnan (n = 29) provinces of China. In order to isolate E. coli, swabs were streaked out on MacConkey agar plates (Qingdao Hope Bio-Technology Co., Ltd., Qingdao, China) and incubated at 37 °C for 18 to 24 h. The putative E. coli isolates on MacConkey agar (bright pink with a dimple) per sample were transferred to eosin methylene blue agar (Qingdao Hope Bio-Technology Co., Ltd., Qingdao, China) for further purification and were incubated at 37 °C for 18 to 24 h. One colony with typical E. coli morphology was selected from each sample and identified by conventional biochemical methods according to ‘Bergey’s Manual of Determinative Bacteriology’. In addition, a total of 372 E.coli strains were respectively donated by National Key Laboratory of Veterinary Biotechnology, Harbin Veterinary Research Institute, Chinese Academy of Agricultural Sciences (n = 108), Husbandry and Veterinary College, Jilin University (n = 112), and College of Animal Husbandry and Veterinary Science, Henan Agricultural University (n = 152). All of the bacterial isolates were confirmed by polymerase chain reaction (PCR) . Broth microdilution testing was performed in accordance with the guidelines in CLSI document M07-A9  at the following laboratories: Department of Microbiology, Department of Pharmacology and Toxicology, and Pharmacy Department in Northeast Agricultural University, Harbin, China. Pure powder of DANO (Qingdao Hope Bio-Technology Co., Ltd., Qingdao, China) was dissolved in ultrapure water to prepare stock solutions of 5120 μg/mL. Two-fold serial drug dilutions were prepared in broth (Qingdao Hope Bio-Technology Co., Ltd., Qingdao, China) to achieve the final concentration ranged from 0.008 to 128 μg/mL. Each well contains approximately 5 × 105 CFU/mL E.coli and cultured in 96 well plates. Plates were incubated at 37 °C for 20 h. Quality control (QC) isolate E.coli ATCC 25922 was used on each day of testing by the participating laboratories, as recommended by CLSI . Only those results, for which the QC MICs were within the established reference range, were used in the study. The MIC is the lowest concentration of antimicrobial agent that completely inhibits growth of the organism in the microdilution wells as detected by the unaided eye. All MIC determinations were performed in triplicate. The ECV (also known as the wild-type cutoff, or COWT), defined as the highest susceptibility endpoint of the wild-type (WT) population MIC, has been shown to detect the emergence of in vitro resistance or to separate WT isolates (without known mechanisms of resistance) from non-WT isolates (with mechanisms of resistance and reduced susceptibilities to the antibacterial agent being evaluated) [26, 41]. ECVs are calculated by taking into account the MIC distribution, the modal MIC of each distribution, and the inherent variability of the test (usually within one doubling dilution) and should encompass ≥95% of isolates . To analyze the MIC distributions, MICs were transformed into log2 values. The skewness and kurtosis of each MIC distribution were determined. Skewness quantifies the degree of symmetry of the distribution, whereas kurtosis quantifies the extent to which the shape of the data distribution matches the normal distribution. To confirm the presence of more than one MIC distribution, frequency distributions of MIC data were analyzed by nonlinear least squares regression analysis based on the following Cumulative Gaussian Counts equation:Z = (X − Mean)/SD, Y = N ∗ zdist(z), in which the Mean is the average of the original distribution, from which the frequency distribution was created; SD is the standard deviation of the original distribution (calculations were performed using Prism 6.0 software, San Diego, CA). Three parameters were estimated, the mean and SD (both log2), and the total number (N) in the presumed unimodal distribution. N was estimated rather than taken as a constant in the regression, because of the desire to fit the data to the distribution without assuming that N truly contained only wild-type isolates [17, 42]. In vitro time-kill studies were conducted in Mueller-Hinton broth with concentrations of DANO ranging from 1/4 to 32 times of the MICs for E.coli JLP95 (O8), which were tested separately. The initial inoculum sizes of the bacteria used to generate the time-kill profiles were approximately 106 CFU/mL. 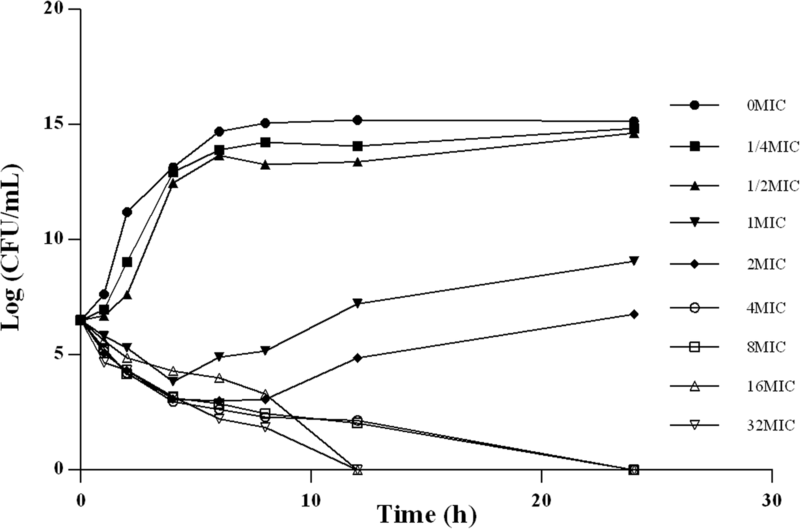 1.2 mL of co-culture was removed from each tube and then 200 μL of co-culture was continuously diluted with 1.8 mL Mueller-Hinton broth to measure the CFU at 0, 1, 2, 4, 6, 8, 12 and 24 h following inoculation. Six 5-months-old healthy fragrance pigs weighing 14–16 kg were donated from Clinical Surgery Department’s pig breeding farm of Northeast Agricultural University for free use. All animals were provided with a drug-free commercial diet to acclimatize for 1 week prior to the study. After the trial, all animals were returned to them for further feeding and used for subsequent laparoscopic trials. All experimental work was performed in accordance with the animal ethics guidelines approved by the animal care and ethics committee of Northeast Agricultural University (Heilongjiang Province PR China). DANO (purity > 99%) was obtained from Zhejiang Guobang Pharmaceutical Company Limited, China. The pure reference standard of DANO was obtained from the Sigma-Aldrich (China). DANO was intramuscularly injected at 2.5 mg DANO/kg body weight in each pig. Blood samples (5 mL) from the brachiocephalic vein were collected into EDTA dipotassium salt tubes at 0.15, 0.5, 1, 2, 4, 6, 8, 12, 24, 48 and 72 h after injection. Plasma was separated by centrifugation at 3000 g for 10 min and stored at − 20 °C until analysis. The method for the analysis of DANO concentration in plasma was modified from that described by [43, 44]. The HPLC system Waters 2695 was connected to a Waters 2475 fluorescence detector (λex =280 nm and λem = 450 nm) with a mixture of acetonitrile and aqueous solution (15:85, v/v) as the mobile phase. The aqueous solutions were prepared by dissolving potassium dihydrogenophosphate (0.020 M), phosphoric acid (0.006 M), and tetraethylammonium bromide (0.012 M) in water. The pH of the mobile phase was adjusted to 3.0 by addition of 2 N NaOH. The flow rate was set at 1.0 mL/min; A Waters C18 reverse phase column C18 (250 mm × 4.6 mm I.D. ; particle size, 5 μm) was used to perform HPLC at 30 °C; and the injection volume was 10 μL. Samples were thawed at room temperature, and 10 μL of 50 μg/mL ciprofloxacin (Sigma–Aldrich) was added to plasma (0.5 mL) as the internal standard. After adding 3 mL of acetonitrile, the mixed samples were shaken at 220 oscillations/min for 15 min and then centrifuged at 12000 g for 10 min. The organic layer was transferred into a sterilized tube and dried at 40 °C under nitrogen stream. The residue was dissolved in the mobile phase (0.5 mL), and 10 μL injected for HPLC analysis. The limit of detection (LOD) was 0.005 μg/mL and the limit of quantification (LOQ) was 0.01 μg/mL in plasma, respectively. Standard curves were linear from 0.01 to 1.5 μg/mL in plasma (R2 = 0.9999). The inter-day variation for determination in plasma ranged from 0.18 to 1.50%. The recovery of DANO in plasma ranged from 85.80 ± 0.16% to 103.40 ± 4.89%. PK analysis was conducted by using WinNonlin v.5.2.1 (Pharsight Corporation, Mountain View, CA, USA). Mininmum Akaike Information Criteria Estimates (MAICE) was applied to determine the best fit of model for each pig . 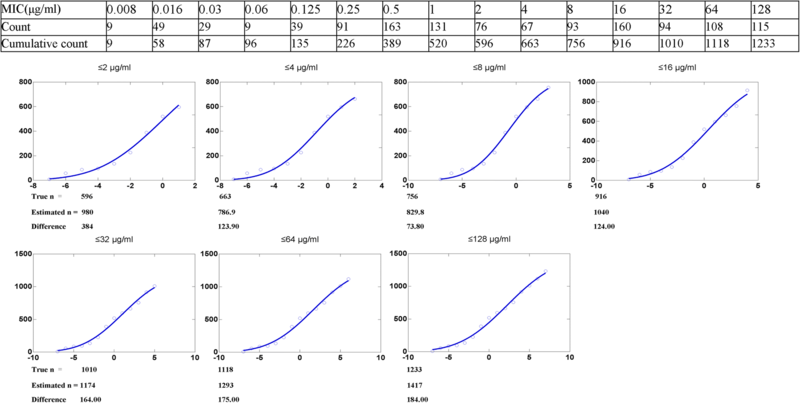 A 10,000-subject Monte Carlo simulation was conducted for each drug at each of the following MIC: 0.008, 0.016, 0.03, 0.06, 0.03, 0.5, 1, 2, 4, 8, 16, 32, 64 and 128 μg/mL using ORACLE CRYSTAL BALL software (version 11.1; Oracle USA, Denver, CO, USA). Based on pharmacokinetic results of DANO in pigs in this study, a conservative PK/PD value (AUC0–24/MIC = 125) was selected to calculate the PTA . AUC0–24 was not measured for the fluoroquinolones, it was calculated as follows: AUC0–24 = Dose/Vss × Kd, where Vss was the volume of distribution at steady state (L/kg) and Kd the elimination rate constant (h− 1) . AUC0–24 was assumed to be log-normally distributed, and the PK/PD indices were calculated for each simulated subject. The PTA was estimated at each MIC as the probability that at least the target level of the PK/PD index is achieved. The COPD was defined as the highest MIC at which the PTA was ≥90% [46, 47]. We would like to thank the following organizations for kindly donating E. coli strains: National Key Laboratory of Veterinary Biotechnology, Harbin Veterinary Research Institute, Chinese Academy of Agricultural Sciences; Husbandry and Veterinary College, Jilin University; and College of Animal Husbandry and Veterinary Science, Henan Agricultural University. This study was funded by the National Science and Technology Project and National 13th Five-Year Science and Technology Project (prevention and control of major epidemics and comprehensive research and development of safe and efficient aquaculture of livestock and poultry, 2016YFD0501302). The funders had no role in the design of the study and collection, analysis and interpretation of data and in writing the manuscript. XZ conceived of the study and participated in its design and coordination and helped to draft the manuscript. YY design the experiment, completed the experiments and draft the manuscript. ZY, LJ, CP, XT, LR and YH help to carried out the bacteria isolation, the MIC determination and in vitro time kill curve studies, IM revised the manuscript. All authors read and approved the final manuscript. All experimental work was performed in accordance with the animal ethics guidelines approved by the animal care and ethics committee of Northeast Agricultural University (Heilongjiang Province PR China). CDC. CDC (2014). Best practices for comprehensive tobacco control programs Retrieved from CDC Web site: https://www.cdc.gov/ecoli/etec.html. Accessed 26 Jan 2019.